Author K.E. 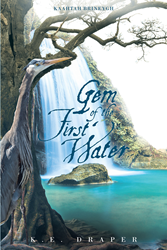 Draper’s New Book “Gem of the First Water: Kaatah Brineygh” Is a Story of Connection and Expansion of Humanity’s Gifts in an Alternate Reality. Recent release “Gem of the First Water: Kaatah Brineygh” from Page Publishing author K.E. Draper is a lyrical tale depicting a utopian state of perfected human nature. K.E. Draper, a former private chef and caterer, pottery instructor, and member of the League of New Hampshire Craftsmen, has completed her book “Gem of the First Water: Kaatah Brineygh”: a poetic journey to a world of harmony and eternal peace. There are no cell phones, no iPods, iPads, PCs, or laptops. all human but some with gifts of enchantment. They work together to expand and grow their world and lives. Published by New York City-based Page Publishing, K.E. Draper’s book is an aspirational tale of humanity in a state of purity and infinite potential. Readers who wish to experience this inspired work can purchase “Gem of the First Water: Kaatah Brineygh” at bookstores everywhere, or online at the Apple iTunes store, Amazon, Google Play, or Barnes and Noble.